After their long summer apart, Ally and Jake were hoping for a drama free senior year. Unfortunately, it doesn't look like things will work out that way...again. — It turns out that Chloe is pregnant and says that Jake is the father. Hammond is pissed at his best friend, but mostly can't believe that Ally would stay with Jake. But Ally is tired of being apart from Jake and is willing to make it work. But that is easier said than done when Jake starts blowing Ally off to go to doctor's appointments with Chloe and Ally joins the school play and meets a new cute guy. I started reading this series last year, and I really enjoyed reading the first two books in the series. 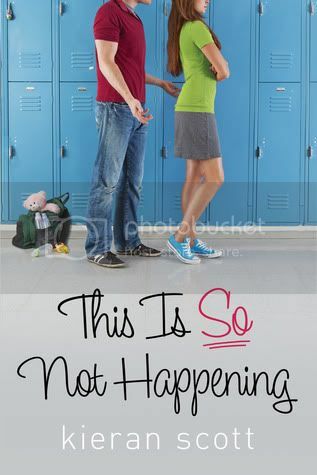 I was so excited when ‘This is So Not Happening’ finally arrive in my mailbox. I couldn’t wait to dig into it. After the events from the previous book left me hanging, I was really excited to see what would happen to the characters in this book. I definitely enjoyed Ally more in this book than I did in He’s So Not Worth It. Poor girl, she finally gets her life back on track, when the big boom is dropped on her. She definitely handled things better than I would. I found myself to be increasingly frustrated with Jake, and as much as I loved him in the first book, I found myself completely shocked by all the drama he put Ally through in this book. And to be honest, it frustrated me even more that Ally was so forgiving of him. I know I wouldn’t have been. I enjoyed the secondary characters in the book just as much as I did in the previous books. Annie is such a great best friend to Ally. I was also glad to see that all of the girls pretty much got along this time around. It was the boys that were a handful! This book, along with the whole series, has more teenage drama in it than I ever experienced in my whole entire life. Usually I am not into drama, but I couldn’t get enough of it in this series. From the characters to the storyline and the drama, they all blend together to make quite an addicting read. I definitely just HAD to know what was going to happen next. The ending was well written, and I felt that the series ended in the best way possible. Overall, I really enjoyed this series, and I hate to see it come to an end. I am definitely looking forward to reading more books by Mrs. Scott in the future! This series is new to me but it looks like something I should check into. "This book, along with the whole series, has more teenage drama in it than I ever experienced in my whole entire life." Hahaha I get this feeling all the time when I read YA books! Sometimes the drama can be a bit too much for me, but other times I love drowning myself in it, especially when it's done well. Thanks for the review Christy! This is definitely a series I want to read. I heard Kieran Scott speak and she's hilarious--which always bodes well for the books. Plus, I like when books tell a whole story and then continue with more in the next book. OMG... I looked at the cover and was like "ehhh... maybe maybe not. Looks very high school musical" and then read the description and oh my dramarama, I love it! I'm glad you like this series, because I am going to have to check it out.